Health Secretary Alan Johnson is to call this week for fluoride to be added to Britain's water supplies. Mr Johnson will say that fluoridation is an "effective and relatively easy way" to reduce tooth decay among children in poorer areas. Critics say excessive fluoride can cause discolouring of the teeth and pitting of the enamel. 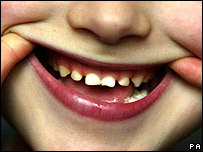 Six million people in England, mainly in the North-east and Midlands, receive water with added fluoride. But the government is keen to expand that across the country. It has the support of the British Dental Association, which has argued that targeted water fluoridation would, at a stroke, dramatically improve oral health among the needy. In an announcement on Tuesday, Mr Johnson will say: "I want the NHS to do much more to prevent rather than just treat disease." He will argue that fluoridation will "help address health inequalities, giving children from poorer backgrounds a dental health boost that can last a lifetime". The Department of health says children in Manchester, who receive no added fluoride in their water, are twice as likely to have tooth decay as youngsters in Birmingham, where fluoride has been added for four decades. It is thought the government wants to encourage debate on the subject rather than oblige water companies to act. In 2003, MPs approved legislation to make it easier for fluoride to be added to drinking water in England and Wales. Few water companies have done so for fear of legal action by anti-fluoride campaigners. Opponents point to studies which have linked high levels of fluoride to bone cancer and brittle bone disease. They also argue that too much fluoride can be counter-productive, damaging and discolouring enamel in a condition known as fluorosis. They say reducing sugar intake and regular brushing is far more effective.